Ever since I added expression based labels, including the new expression builder UI, something that I always wanted to add is the ability to define custom user defined functions in Python (or C++) and use them in an expression. The expression engine is used for labels, rule based rendering, layer actions, field calculator, and atlas composer tags. Thanks to the all the awesome work on the expression engine by Martin all this cool stuff is now possible. Today I pushed a commit into master that adds the ability to define a function in Python (or C++), register it in the expression engine, then use it anywhere expressions are used. Lets take a use case from Ujaval Gandhi and his example of counting vertices for each feature. 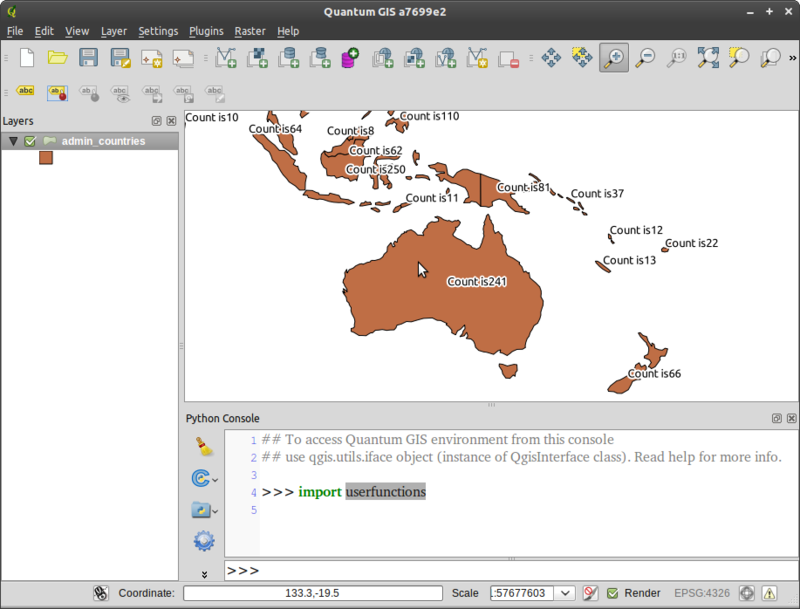 First we need to import the new qgsfunction decorator function from qgis.utils. The qgsfunction decorator will take a normal Python function, wrap it up in the class used to define a function, and register it in the engine. 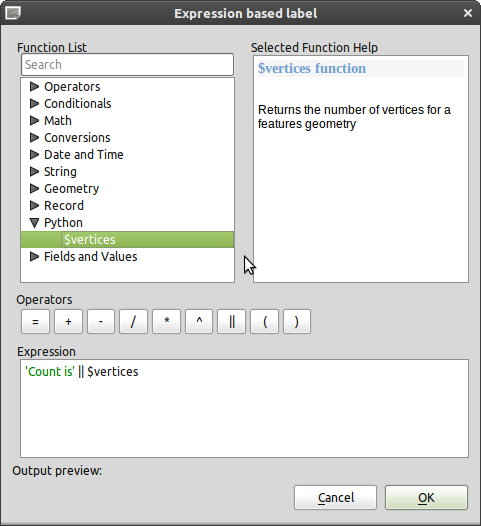 @qgsfunction(0, "Python") means we are defining a new vertices function that takes 0 args and lives in the “python” group in the expression builder UI. Any custom function must take (values, feature, parent) as python args. values is a list of QVariants passed into the function, feature is the current QgsFeature, and parent is expression engine node (you use this to raise errors). Pretty simple. Get the geometry from the feature, check if it’s a polygon, if it is then count the number of vertices and return that number. Nice! Notice also that the function doc string is used as the function help. How cool is that. You can also see the $ sign in front of the function, this is because any functions that take no args are considered special and use the $ sign as a convention, this is all automatic when the function is registered. You must unregister a function once you are finished with it using QgsExpression.unregisterFunction(name). This mainly applies to plugins where the user might unload your plugin and the code is no longer available. In the above example we could import userfunctions and never unregister because we plan on using it for the whole session. You can’t override the built-in methods. It sure does. As long as you unregister the function when the plugin is unloaded. 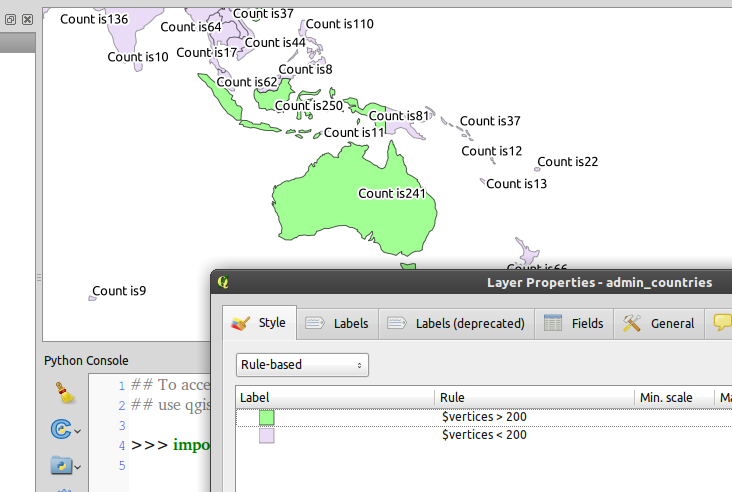 You can also stick them in startup.py which QGIS now loads on startup each time. Great Feature! Is or will it be possible to forward parameters such as attribute values to the user defined python functions?